This is a case of very bad timing. Normally, unless I am using the cafe, when I am on a ferry I am outside. I am always on the look out for birds or on occasions mammals. As we left Coll I had a quick meal and then went up on deck. It was soon misty with occasional light drizzle but nothing too bad. Passing Tobermory Point, I caught a glimpse of one of two very distant Porpoises. Shortly after that it started to rain a bit heavier and it chased inside everybody else that had been on the top deck. I went down a flight of stairs which put me on a lower deck with table and chairs around, with the upper deck acting as a roof to keep me dry. A slight disadvantage of being down here was a row of bars on each side of the boat, I presume to help hold up the upper deck. I had been down there for a few minutes when I spotted quite a large pod of Dolphins to the front starboard (the right), of the ferry. They were putting on quite a show leaping out of the water. I quickly tried to take photographs of them. My camera lens would fit between the bars but did not have enough room to get the angle required to shoot the Dolphins. I rushed upstairs, as other people came rushing out from inside of the ferry to watch the display. 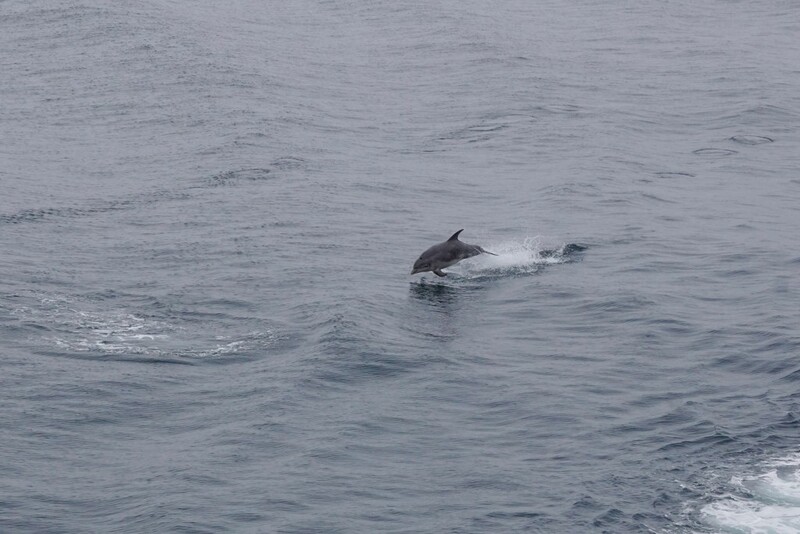 The Dolphins were all over the place, and two of them came closer than I have ever seen them before. They were actually in the white water wash streaming down the side of the ship, and I could just look over the rail, directly above them as they were leaping out of the water. This show wowed everyone who had the luck to see them. I was talking to people later who use the ferries regularly week in, week out, and have seen them many, many times before, but even they were very impressed with todays show. However it was all a bit chaotic, with changing decks, and trying to work out where they were heading, and this was about the best shot I got. So although this holiday ended early, it was still very enjoyable and with Dolphins, Porpoises, Hares, Otters, Seals, and White Sea Tailed Eagles amongst the very many animals I spotted, it is somewhere I hope to return to very shortly. Nicely captured fully out of the water. Sounds like you've been on quite an adventure. This sight has rounded off your adventure quite nicely I think. Quite the stories and photos; given the weather you persevered longer than I would have! Thank you for the narrative accompanying this great photo. Felt like I was there and could feel the thrill of what you were seeing. Weather is such a downer sometimes! Great pics from a fab trip! great action shot and timing.. Thanks for the enchanting narrative... and this happy dolphin.